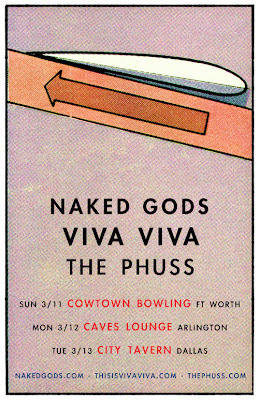 Tonite, we begin our Texas adventures, teaming up with our main homedoods, the Naked Gods, from Boone, NC, and local Texas rockers, The Phuss. Here are all the details, with links to our Facebook event pages, where you can RSVP and invite your friends! From there, we head to Austin for SXSW, from Wednesday March 14, to Saturday March 17. We've lined up three shows and a house party, highlighted by the Filter Magazine & Converse Rubber Tracks SXSW Showcase with Clap Your Hands Say Yeah, Alberta Cross, YAWN, Rebuilding The Rights Of Statues, at Bar 96, Thursday nite. We're on at 8:30PM. We're only three days into the tour so far, having left Boston on Thursday afternoon. The Fort Point Recordings + Vanya Records + Boston Phoenix, Austin T Party Kickoff at Good Life on Wednesday nite was amazing sauce! The next day, with the van packed, we hit the road, with stops for some great shows in Lexington, KY on Friday nite, and Jackson, MS on Saturday nite. 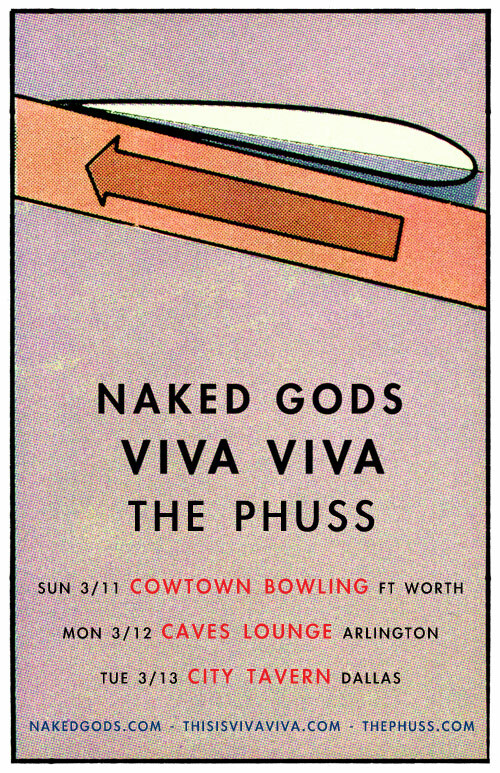 Once again, we are keeping all our friends and family updated on our adventures with our Viva Viva SXSW 2012 Tour Diary. Check out the first installment below, featuring the song, Even The Score, off our new EP, What's The Kim Deal?, on Fort Point Recordings, in stores on March 27. Check back here for more updates, and of course, check us out on Facebook and Twitter, for even more nonsense.